I made this card for The Paper Players 100th challenge. I am really enjoying the challenges over there and can’t wait to see what they come up with for the next 100 challenges. I had the idea for this card in my head, but boy did I have a hard time getting it on paper! It took five tries to get something close to what I had in mind. I am not 100% satisfied with the results, but I do like it. The Paper Players challenge I chose was a #90, a color challenge to use Not Quite Navy, Pool Party and Certainly Celery. These colors are so pretty together! 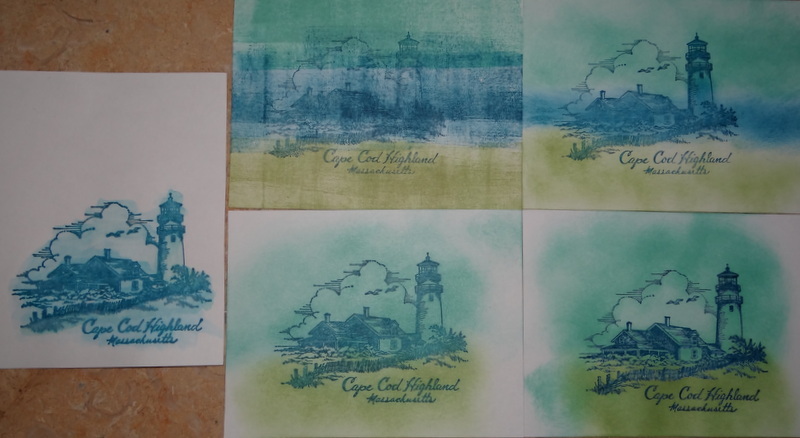 I chose the PSX Cape Cod Highland Lighthouse for my image and wanted to water color it. I stamped the image in Night of Navy and heat set it with my heat gun, but when I started to color with the water brush, the color bled. I decided to brayer the three colors on the background and then stamp the image, but I didn’t like it, the Night of Navy was too dark. Then I decided to sponge the background and stamp the image in Night of Navy, but I still didn’t like it and decided not too use Night of Navy in the Background. For number four, I sponged the background in Certainly Celery and Pool Party and stamped in Night of Navy. I liked this one much better, but I still thought it needed something more. For number five, I decided to emboss the image with VersaMark, Night of Navy and clear embossing powder and sponged the background with Certainly Celery and Pool Party. I matted the image in Night of Navy and Certainly Celery cut with a Nestabilities die. For the background, I used a textured cardstock from a DCWV Mat Stack that matches Pool Party. I added a layer of Night of Navy Designer Series Paper matted in Night of Navy and mounted on a Night of Navy card base. 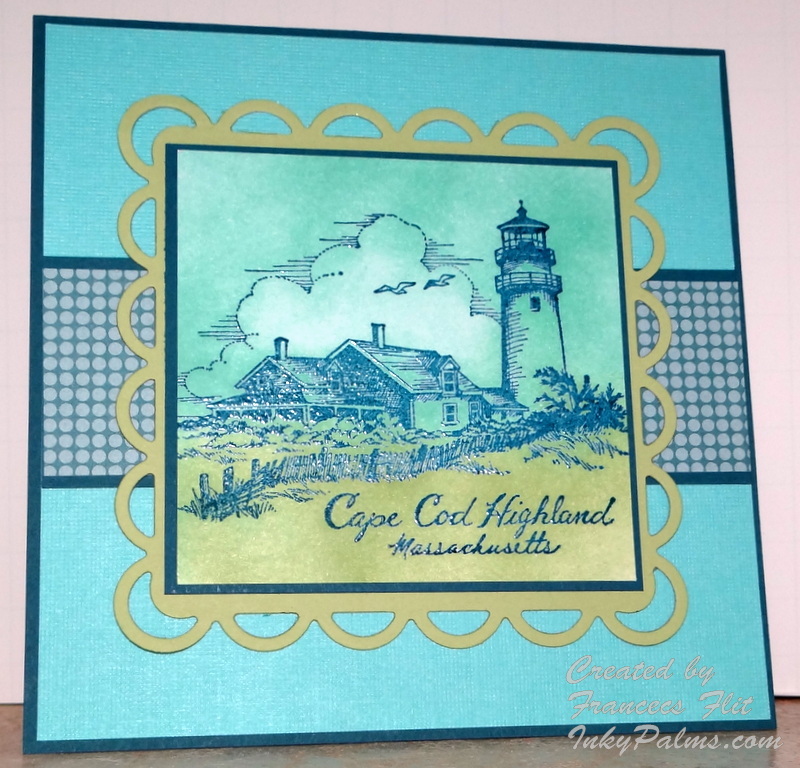 I cased the layout from Roberta, this week’s Stamping Queen on Splitcoaststampers. Here is her lovely card, Vintage Spring. I love lighthouses! No, I don’t collect lighthouse tchotchkes, wear lighthouse patterned clothes and carry a lighthouse themed bag, but I do love lighthouses. More specifically, I love lighthouse stamps. I have way more than I really need and there are several more that I really want. I am desperately seeking the PSX Key West Lighthouse stamp and wouldn’t mind getting my hands on the New London Harbour Lighthouse either! My love of lighthouse began when I was a small child growing up in Miami. Our favorite beach was on Key Biscayne, right next to the Cape Florida Lighthouse and I loved swimming and playing in the shadows of the lighthouse. The boys loved to tell pirate stories about the lighthouse, and somebody always had the bright idea to dig for buried treasure. My favorite part of the day was Palm tree races, seeing who could get the highest up the fastest. I was pretty good at it too, until one day I got up too high for my own good! I still remember hanging on to that Palm tree for dear life, my scrawny arms and legs wrapped around the trunk while all the kids were yelling at me to jump. My brother finally came over and stood under me, ready to catch me if I fell, and coaxed me down to the cheers and clapping of our friends. I was so embarrassed but also so grateful for my big brother, I love you Derry! 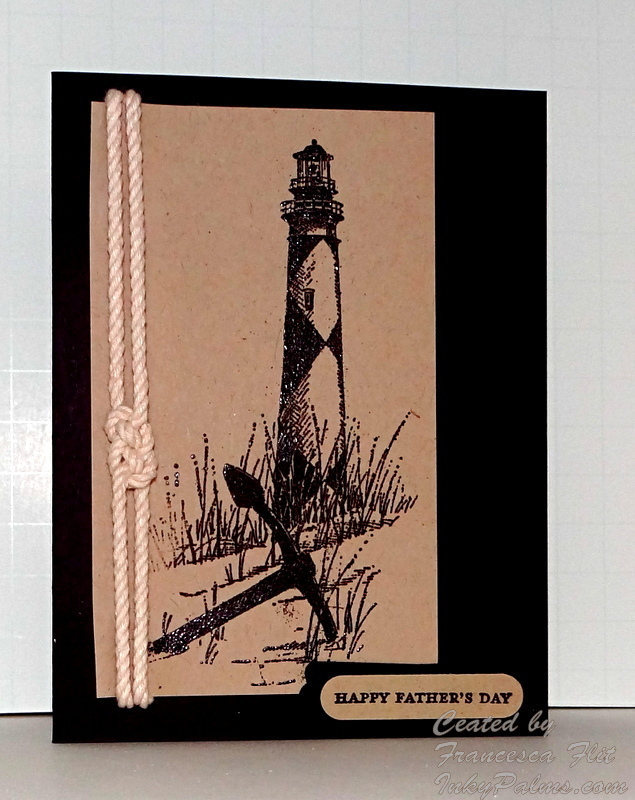 My Father’s Day card is a quick and easy CAS card using today’s Sketch Challenge SC389 on Splitcoaststampers. I needed a Father’s Day card, so I replaced the girly swirls with Rope cording. 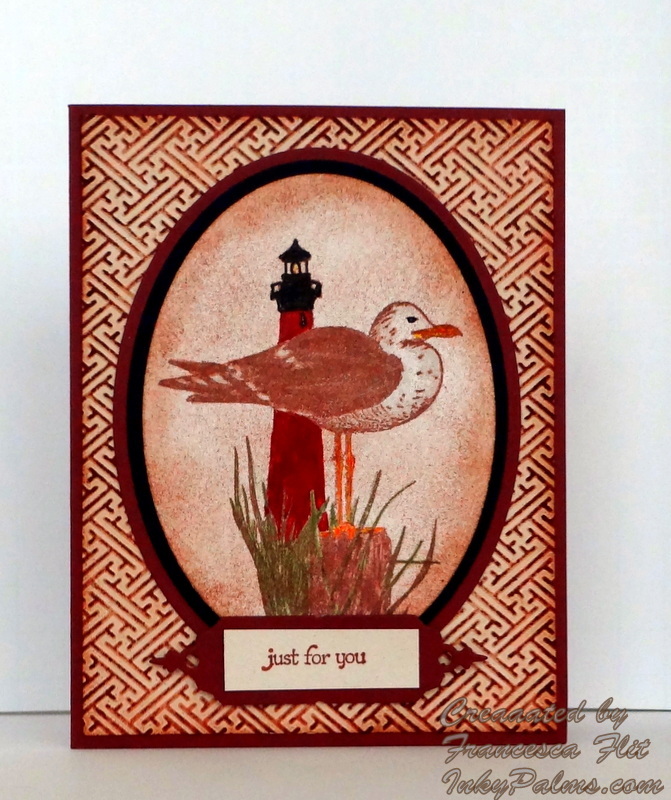 I stamped the Impression Obsession Cape Lookout Lighthouse in VersaMark ink on Stampin’ Up! Kraft cardstock and embossed with Stampin’ Up! Black Embossing Powder. I tied a Sailors knot, link to tutorial below, with two pieces of Stampin’ Up! Rope cording and attached to the panel with glue dots. One quick tip is to separate the cords in the rope on the back to help it lay flatter. I mounted the Kraft panel on a Basic Black card base, stamped the sentiment from Stampin’ Up! Teeny Tiny Wishes in Black and punched with the Stampin’ Up! Word Window Punch. I layered it over a Black mat punched with a Stampin’ Up! Modern Label Punch. That’s it, done!